name, the symptoms cause adverse reactions in the body. In isolation, each one of these symptoms can mean different things (including stress), but if you can check off most of the boxes, you most likely have “Adrenal Fatigue.” Adrenal fatigue is a state where the adrenal glands are overworked and unable to perform their functions effectively. Symptoms include difficulty getting up in the morning, not feeling rested after sleeping, often waking throughout the night, or daytime fatigue even after a good night’s sleep. You may have increased energy as the evening progresses, leaving you unable to fully relax. You may be quick-tempered or impatient. You may get sick often or have illnesses that last longer. You may feel foggy, forgetful or light-headed when rising from a reclined position. Adrenal fatigue can also cause an inability to lose weight, especially around the waist even if eating healthy and exercising. The adrenals are a pair of glands that sit on the kidneys and produce several hormones, including the stress hormones cortisol, epinephrine and norepinephrine. These hormones are associated with the “fight or flight” response, stress management, regulating metabolism, sleep, blood sugar and inflammation. When your adrenals are “fatigued,” they are not really “tired” but instead running out of the necessary hormone precursors your body needs to produce much-needed stress hormones. The longer the drain on your adrenals, the more hormones are used up and not replenished by your body. 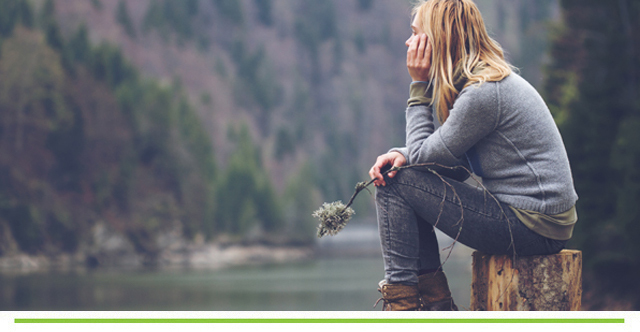 It has taken years of unmanaged stress on the body for the Adrenals to get to the point of “adrenal fatigue or “adrenal burnout.” It can take 6-12 months of continued supplementation, food and lifestyle adaptations for your adrenals to heal and those much-needed adrenal hormones to balance out to more normal behaviour. When your body is under stress, it requires a lot of Vitamin Bs and Cs. The various B Vitamins play a role in improving the metabolic pathways that boost energy, reduce fatigue and help to create adrenal hormones. Vitamin C is directly involved in the production of the cortisol in our adrenals. It is also a building block for recovery of adrenals that have been fatigued. Both of these vitamins are water-soluble vitamins that do not stick around in the body. We use them; they run out; we need more. A deficiency is the start of denying your adrenals the vitamins they need to produce essential stress hormones. 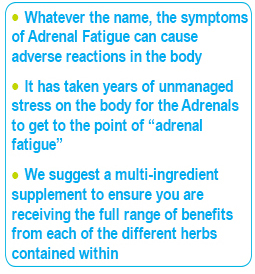 Many herbal products can be beneficial for Adrenal support. 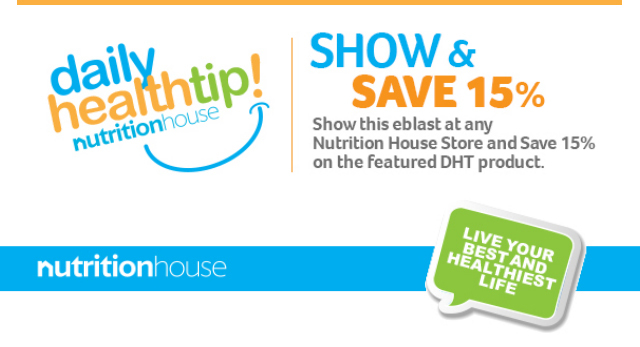 You can certainly take each of these supplements as stand-alone. However, we suggest a multi-ingredient supplement. A multi-ingredient supplement can help ensure you are receiving the full range of benefits from each of the different herbs in the correct ratios needed. 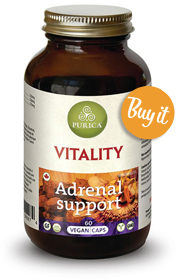 We suggest Adrenal Specific Products, such as PURICA Vitality Adrenal Support. It contains Organic Chaga mushrooms, PURICA Cordyceps Mushrooms and PURICA Ashwagandha. The combination of medicinal mushrooms and adaptogen herbs can help balance your cortisol production and helps your body to better balance the stress hormones and reduce the impact of stress. Consider a visit to the endocrinologist if your symptoms (listed above) do not alleviate, regardless of how you try to manage it. Remember, it takes months and years of constant stress for your adrenals to get to this point. Stay committed to getting them back on track.